By creating this endowed scholarship in support of EXPONENTIAL: The Campaign for UNC Charlotte, Sam Jones honors his wife’s career in education while inspiring future teachers to bring passion and innovative ideas to their careers that will benefit students and the community. “She’s always been a strong proponent of creative thinking and problem solving and has been very self-sacrificing in her career in education. [I hope] this scholarship is a blessing to its recipients and that they try to support someone else in their lifetimes,” he said. The scholarship will assist undergraduate and graduate students in the Cato College of Education with demonstrated financial need, with priority given to students from Alamance and Mecklenburg counties. Gloria Jones taught for 32 years, mainly in gifted education, in Charlotte-Mecklenburg Schools (CMS). 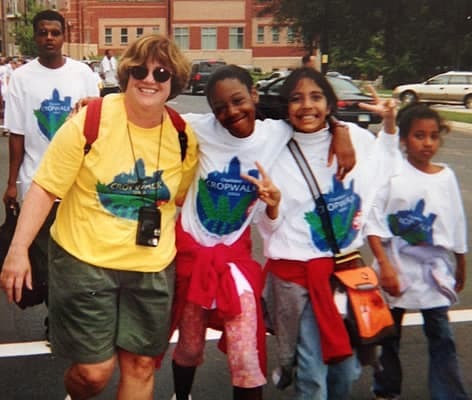 She spent more than 20 years as coach and coordinator for Odyssey of the Mind, a creative problem-solving program that engages students in learning by allowing their knowledge and ideas to come to life in an exciting, productive environment. “She had a wonderful ability to get to know her students as individuals and their strengths and their weaknesses, how to motivate them, how to tap into their interests, and she was very creative in terms of the units of study that she came up with,” said Becky van Wie, whose three sons had classes with Jones. Jones volunteered in the community with Second Harvest Food Bank, creating the first Kids Cafe in Charlotte to provide meals for children. Working with the Crop Walk Leadership Team, she and her students also raised money and awareness to combat hunger worldwide. In 2000, she received the Church World Service Presidential Leadership Award presented by Ambassador Andrew Young for this effort. In retirement, she has continued her work as an advocate for education and will soon assume the role of president of the local chapter of Delta Kappa Gamma, an international honor society for women in education. Gloria Jones graduated from UNC Charlotte with a Bachelor of Arts in History in 1970 where she also earned a teaching certificate in elementary education. She returned to UNC Charlotte as a graduate student and earned a Master of Education in Special Education in 1987. Students will be eligible to receive the Gloria Moore Jones Education scholarship next fall.